Animal organs. Integument. Atlas of plant and animal histology. Main components of the mammal skin. 1: epidermis, 2: papillary dermis, 3: reticular dermis, 4: hypodermis, 5: eccrine sweat gland, 6: adipose cells, 7: hair follicle, 8: sebaceous gland, 9: apocrine sweat gland, 10: Pacini corpuscule, 11: erector muscle, 12: blood vessels, 13: sensory nerve ending, 14: dermal papillae, 15: epidermal ridges, 16: thin skin. Integument totally covers the body. In vertebrates, it is made up of the skin and its derivatives or appendages. The skin has three components: epidermis, dermis and hypodermis. Derivatives of the skin are hair, nails (scales and feathers in non-mammal vertebrates) and those glands that release their content over the external body surface. When an area of the skin is under intense mechanical stress (pressure or friction) the epidermis and dermis increase in thickness, and all the layers of the epidermis can be clearly observed. These areas are known as thick skin. On the other hand, those areas having thin skin show epidermis with a few cell layers and a thin dermis. Thin skin is located in body surface areas under light mechanical stress. Main components of the thin skin of mammals. Main components of the thin thick of mammals. Epidermis is the outermost layer of the skin. 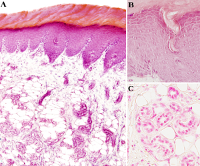 It is a keratinized stratified squamous epithelium mostly composed of keratinocytes. Epidermis prevents water loss, is a barrier against toxic substances, withstand mechanical stress and is involved in immune responses. Kerantinocytes form this layer making cross-linked scaffolds by means of cellular junctions, like desmosomes. Epidermis may show different thickness depending on the mechanical forces it endures. For instance, it is thicker in palms and soles, but also in other areas undergoing strong mechanical frictions. Regardless of the thickness, epidermis is divided in four layers or strata that from the basal to the apical surfaces are: stratum basale or germinative, stratum spinosum, stratum granulosum and stratum corneum. In the thick epidermis, an additional stratum between the stratum corneum and stratum spinosum is observed, which is known as stratum lucidum. The stratum basale is where keratinocytes proliferation takes place. The new keratinocytes detach from the basal lamina and migrate upward while they differentiated to form the stratum spinosum, and later die to became the keratinized dead cells of the stratum corneum. This is a rather complex process since there is a constant flux of cells from the basal to the superficial part of the epidermis for renewing and repairing the tissue, but at the same time there must be a tight cohesion between cells to make the epidermis a resistant barrier. In the epidermis, other cell types are found intermingled with keratinocytes. Melanocytes synthesize melanin, which protects against the ultraviolet radiation. Langherhans cells, or dendritic cells, are involved in the immune response as antigen presenting cells. Merkel cells have a mechanical sensory function. 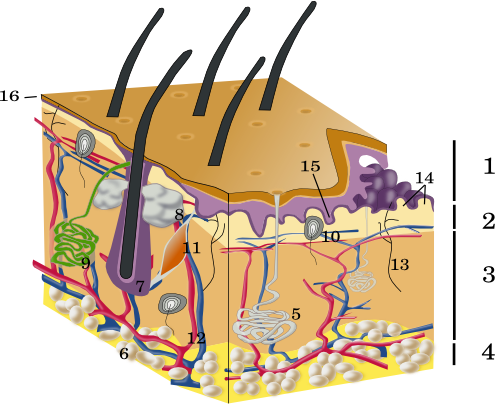 All these cell types are mostly located at the deeper epidermal layer. Epidermis, as other epithelia, lacks blood vessels and rests on a specialized layer of extracellular matrix known as basal lamina. The dermis is connective tissue located under de basal lamina. This layer provides mechanical support and feeds the epidermis and skin appendages. There are protrusions of dermal tissue toward the epidermis known as dermal papillae, which are surrounded by downward epidermal expansions known as epidermal ridges. Both, dermal papillae and epidermal ridges are easily observed in the thick skin. They increase the contact surface between dermis and epidermis, reinforcing the adhesion strength. 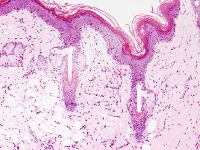 Two layers can be distinguished in the dermis. The papillary dermis, closer to the epidermis and in contact with the basal lamina, forms the dermal papillae and it is connective tissue with abundant blood vessels for feeding the epidermis, but also for body temperature regulation by vasodilation and vasoconstriction. In this layer there are also many nerve sensory endings, some of them cross the basal lamina and enter the epidermis. 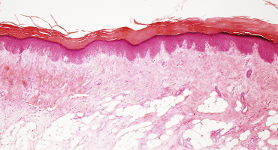 The deeper part of the dermis is known as reticular dermis, which is dense irregular connective tissue with fewer cells, compared to papillary dermis. However, it shows a well developed extracellular matrix with thick collagen fibers. The hypodermis is found below the dermis. It is also known as subcutaneous tissue or adipose panniculus. The hypodermis is mostly constituted by adipocytes surrounded by loose connective tissue. The thickness of this layer is variable depending on the body part, the age and it is also different between men and women. Head lacks hypodermis and tthe dermis is in contact with the cranial bones. Smooth muscle cells for hair to stand erect can sometimes be found in the hypodermis, and a few striated muscle cells in the neck and face. Epidermis derivatives are nails, hair and glands, all of them are originated by induction signals coming from underlying dermis. Hair grows in invaginations of the epidermis known as hair follicles, which are irregularly distributed through the skin of the body. Sebaceous glands, which are part of the hair follicles, and appocrine sweat glands release their content to the lumen of the hair follicle. Eccrine sweat glands, however, release their content directly to surface of the skin. These glands are distributed all over the body skin. Nails are hard and compact layers of keratin located in the dorsal part of the finger tips. In other species, other epidermal derivatives can be found, such as horns, scales, feathers, and hoofs.